In 1888, The Examiner immortalized the emotional roller coaster of baseball through Earnest Lawrence Thayer’s poem. We swelter in the stands while our hero, Casey Jones eyes three pitches only to fail to crack his bat on any of them. Casey discounts the first two balls as unworthy of his time. And with the third, the fury of the swing does not meet its target. Casey strikes out. Sometimes our kitchen heroes make us feel like that day in Mudville. Flat and monotone. A bit empty like a dried gourd. 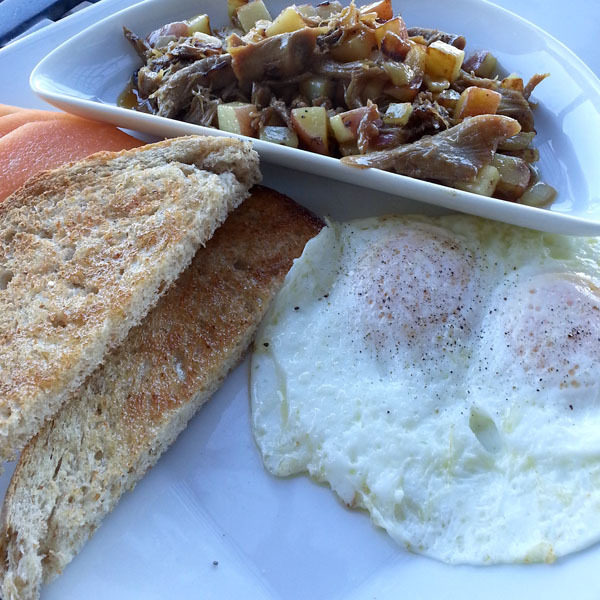 Take for example the breakfast item described as duck confit hash with eggs (pictured). The first glance catches half-moon shapes fighting for visual real-estate. Principally beige in color with a slight accent of melon. A fork of hash with eggs and toast point lands on the tongue. The rich meat and rich eggs roll around on the palette. The oils and umami flavors stack upon each other like a tower. Then it vanishes on the swallow. No memory. No intrigue. Good news. Food is a lot easier to fix than baseball. Scientists generally agree that 5 tastes (sweet, salty, sour, bitter, umami) are detectable through genetic receptors on the human palette. Our friends in Asia talk of pungency or piquancy as another additions to the flavor family. That’s the relative “heat” we experience from a hot chili or black pepper. Yes, the nose plays a huge part to the gustatory process. That’s where the power of herbs find their home. Or your ability to distinguish between an apple and a pear. The eyes and ears too make this a full sensory experience. Back to breakfast in question. What might you add to transform this dish from low-thinking fuel to high-thinking cuisine? To push it Northbound in Maslow’s hierarchy of needs? An accent of preserved lemon might have lifted the complexity of the dish with sour and salty notes. Maybe fresh rosemary in the hash. Or the bite from jalapeno baked into bread instead of whole wheat. And let’s be very clear. This post means no harm to the chef’s reputation. This same wizard previously landed a rainbow complete with a pot of gold. 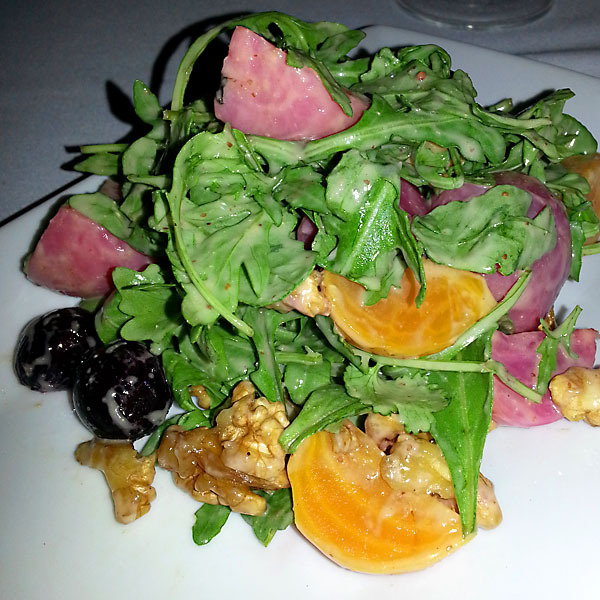 Check out the beet, walnut and arugula salad (pictured). Peppery, bitter notes play off subtle sweetness. Leafy textures slow dance with root vegetables dense and giving. Walnuts crackle and olive pop with umami. A symphony for the palette. The story of taste is a complex one, built on evolutionary biology and penetrated by psychology. We eat because of nutritional needs to fuel the body. And for some of us, to fuel the mind. Let’s just take the lesson from both the home runs and the no-hitters. Bacon could have changed all of this! Yes! Smokey salty works. But then again when hasn’t bacon cured something. You name it. Everything tastes better with bacon.